Relatively solid design and works well. Comes at a low cost while not compromising functionality. Very simple and intuitive in its operation. It’s no secret: For a number of products, the market is saturated with the original version as well as their replicas. While most people associate imitations with inferiority where both performance and durability are concerned, that’s not always the case. You’ll be surprised how some of them function just as well or maybe even better than the original products. Also, you’re guaranteed to save a few dollars as they’re usually cheaper than the original version. A good example is the Durametric scanner we’re reviewing today. 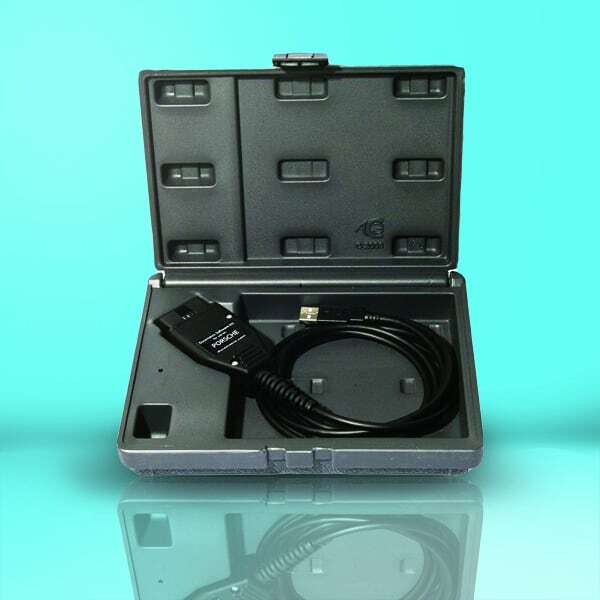 This device is a low-cost alternative to buying the factory Porsche diagnostic tool. However, despite its lower price it offers all the functionalities present in an OBD scan tool. In fact some of its features exceed those present in the factory version—the ability to identify the number of ignitions in certain rev brands being one of them. Still not convinced? The point of this review is to let you in on its many outstanding features and capabilities. You might just be impressed. By simply plugging this device into your Porsche you can access all the information regarding the status of your vehicle systems—information you’d be charged hundreds of dollars if you took it to a dealer. Using this tool will in no way damage your car as it’s pretty safe to use. In fact it actually notifies you if you’re venturing into complex areas that require professional attention. This is both a hardware and software tool that operates with your Windows’ PC and is inserted via the USB port. Upon plugging it into your car, the software reads and consequently resets the various modules in your car where necessary. An important factor to note is this version is specifically designed to work on only three cars. If you want a system that’s compatible with multiple cars you’ll have to opt for a professional version. Firstly it’s clear this tool is specifically designed for the Porsche owner but it can still work on a few other car models. Secondly, based on the above information, it’s safe to say this tool is for the car owner looking for a cost-effective scanning tool which doesn’t compromise on performance—the DIYer who isn’t prepared to send their car to the dealer every time a problem arises. A small auto repair shop will also find this tool pretty handy because of its efficient diagnostic capabilities. The versatility of this device allows you to work on a number of vehicle systems including the ABS, alarm and seat memory system to mention a few. As you can see it literally performs all the diagnostic functions that are offered by the original Porsche scanner. Final thought: This tool is worth considering if you want a device that’ll help you understand and clear simple code errors. Granted, it might not pick up on a few error codes, but it sure beats driving to the dealership every time a warning light appears on your dashboard. Overall it’s an effective device that works well—for the most part. It’s quite handy and will save you lots of time and money on unnecessary professional consultations. We think it’s definitely worth the buy.